The Samson 3281 Steam Conditioning Globe Control Valve has been designed for general steam conditioning applications up to ANSI 900 pressure ratings and is available in sizes ranging from 2"-20". The threaded seat design also includes a noise reduction element aswell as offering improved efficiency when compared to an independent desuperheater nozzle and Control Valves system. Body materials include Stainless Steel & Carbon Steel offering temperature ratings up to 932°F (500°C). Available as a pneumatically operated unit, hydraulic, electric and elector hydraulic the versatile design design can also be assembled with various options such as Temperature Extensions, Limits Switches, Solenoid Valves and Positioners. 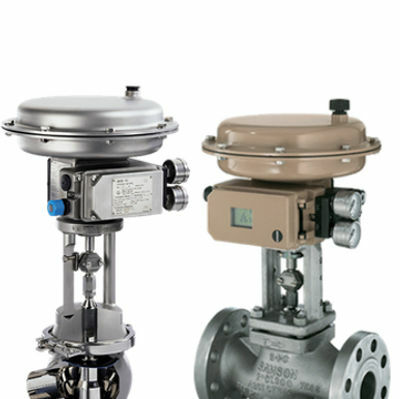 Standard Industrial:The 3241 Samson Globe Control Valves contains a threaded seat design for servicing a wide range of general service applications where pressure requirements are not greater than PN40 or ANSI 300. These applications can include but are not limited to abrasive, corrosive and cavitation services. Standard additional options form the 3241 range such as high temperature extensions, heat jackets, bellows seals, metal seats and anti-cavitation trims are available on an additional short manufacturing lead time making this control valve a versatile and readily available, cost effective solution. In addition to the standard options we are able to cater for more specialised customisation requirements that include the likes of NACE for sour and gas services and cleaned high purity requirements such as oxygen and chlorine lines. The 3241 Globe Control Valves can be automated with several methods of actuation such as pneumatic, electric, hydraulic and electro-hydraulic offering complete customisation and flexibility with on site requirements. Additional options and accessories such as solenoid valves, positioners and limit switch feedback with zoned area requirements can also be assembled and tested at time of order.